A high quality pen starts with precisely trimmed barrels. Trimming the barrel ends prior to turning guarantees a perfect fit by eliminating unsightly gaps between parts. In addition, the pilot shaft removes excess glue from inside the brass tubes that can interfere with assembly of the pen components. 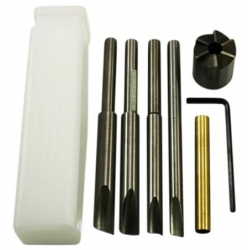 These barrel reamers can be used in a lathe chuck, cordless drill, or drill press. To change pilot shafts, simply loosen the set screw in the cutter head and remove the pilot shaft. 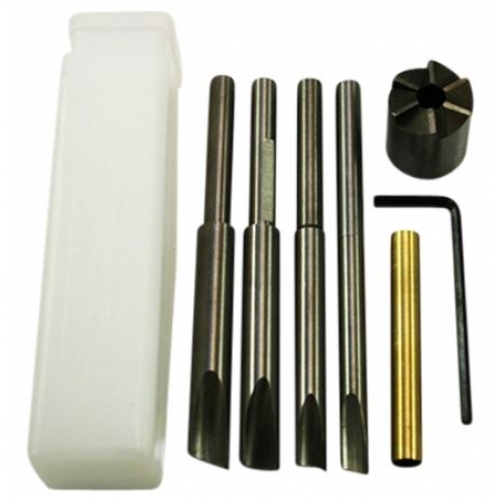 This set includes a 3/4" diameter cutter head, hex key and four pilot shafts to fit kits with drill bit size: 7mm, 'O' size, 27/64" and 10mm diameter barrels and supplied in a handy plastic storage case.